Sarasota impressionistic artist Linda Greaves at her studio. 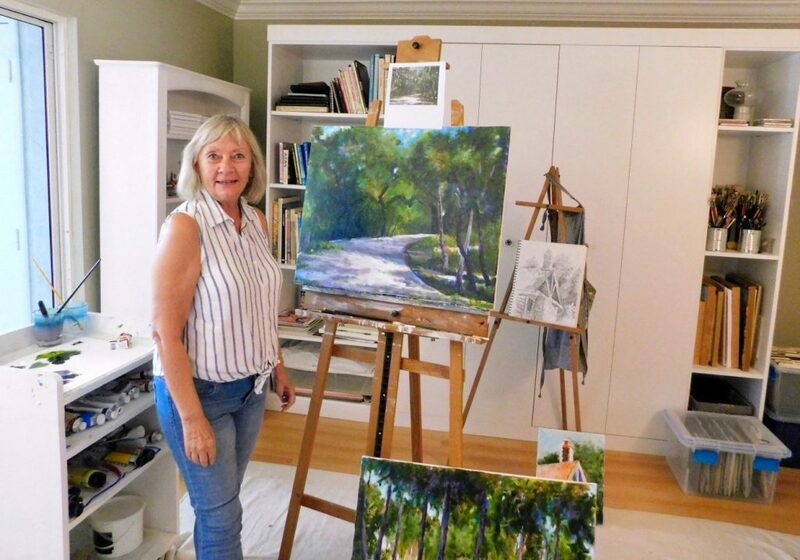 Only two months into retirement, Sarasota artist Linda Greaves has found that sweet spot needed to unleash creativity: a quiet mind. Greaves spends most many her days on location at Myakka River State Park, drawing inspiration from the native Florida environment. She sketches what she sees there, from flora and fauna to cottages and a gnarly old alligator. A photograph allows her to finish the first draft of the work that she calls “the road map” in the studio in her home off Clark Road. She’s just as busy as ever preparing for a show of her paintings in October at Caldwell Trust Co. on Center Road in Venice. 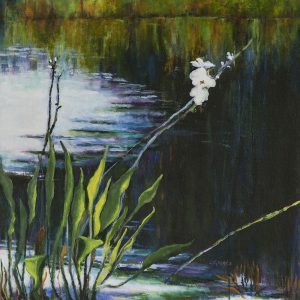 Greaves volunteers on the board of the state park, and serves as an ambassador for natural Florida through her art. 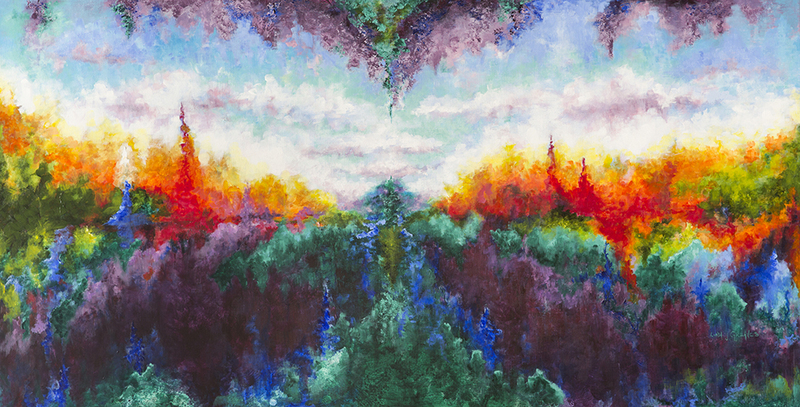 Her paintings, most of which are done in oil, showcase the park’s natural beauty. One in progress focuses on the canopy road that winds through the park. Another shows sunlight illuminating an Old Florida cottage. Greaves infuses blues, pinks, purples into the shadows of the ever-changing landscape she chronicles in the state park off State Road 72. Greaves is a native of Maine, and grew up immersed in nature on her family’s 600-acre dairy farm, forging a connection to the land. As a young girl, she would retreat to her room to sketch and paint. She went to business school and worked as an alumni director for a business college in Maine. After her son was grown, she went back to college at age 46 to finish a business degree. Along the way, she discovered the art department at the University of Maine in Farmington. While taking electives at the school, she was mentored by the art school’s creative director. She remains grateful for his encouragement. “He just instilled in me the thought that I could do this. So ever since that time, I’ve been painting and selling the work,” she says. Her son left Maine to attend school at Florida State, and later moved to the Sarasota area. She was motivated to move to a warmer climate after her car hit a patch of black ice one night, and went barreling through an intersection, ending up in a snowbank. When good Samaritans stopped to check on her, a dazed Greaves rolled down the window and proclaimed, “I’m going to Florida!” She moved here in 1991 and married her soul mate, who was also from Maine. Her husband died six years ago, but not before they traveled all over the state, camping, kayaking and sketching her way through nearly all of Florida’s 175 state parks. 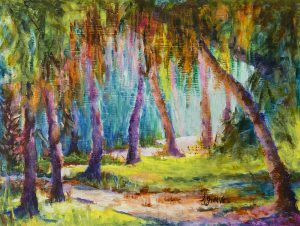 Her love of the area’s natural places is apparent in her paintings. She hopes to motivate others through her art to join efforts to protect the environment and preserve natural places that bring us peace amid the chaos of everyday life. “If it helps them think a little bit about visiting somewhere or protecting the environment, that’s all I could ever ask,” she says.